The Independent Corrupt Practices and Other-Related Offences Commission, ICPC, on Wednesday said it would probe the allegation of corruption leveled against the National Chairman of the All Progressives Congress, Adams Oshiomhole, during the recently concluded primaries of the ruling party. The spokesperson of the ICPC, Rasheedat Okoduwa, stated this during a protest by some members of the APC under the aegis of Coalition for New Nigeria. DAILY POST reports that some angry protesters stormed the headquarters of the ICPC, demanding the resignation and prosecution of Oshiomhole. Addressing the protesters, Okoduwa said the body will begin investigation into petition filed against Oshiomhole soon. “It goes through our normal processes. But let me just sound a note of caution. We receive petitions virtually every hour. So, the petitions are like queuing up and had to be addressed in the sequences they come. 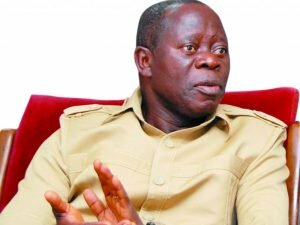 The ICPC’s decision to investigate Oshiomholeis coming after he was quizzed by the Department of State Services over alleged anomalies in the APC primaries.